If I Go to Confession, Will the Priest Tell My Sins? The sacrament of Confession is the sacrament Christ instituted in order to forgive sins. As such, it is classified as a sacrament of healing. When we confess our sins and receive absolution, we have a powerful experience of God’s mercy. The Church recognizes that part of this mercy means that the deeply personal things we confess will not be revealed or used against us. Therefore, the Church binds a priest by the seal of the confessional, which means the priest cannot tell anyone the sins you have confessed for any reason. Canon law is the law of the Church. It deals not with moral laws (what is right and wrong), but rather with the laws set up to govern the Church. Instead, Canon law deals with rules governing the Church and its members. To see what rules the Church has for a priest hearing confessions, it’s important to look at canon law. Canon 983 states, “[I]t is absolutely forbidden for a confessor [this is the priest hearing the confession] to betray in any way a penitent [this is the person going to confession] in words or in any manner and for any reason.” Furthermore, if there is an interpreter, for example if the confessor and penitent speak different languages or if one of them is deaf, the interpreter is also bound to secrecy. If you are standing in line for confession and overhear someone else’s confession, you are also not allowed to tell anyone what you heard. What this means is that the priest cannot say or do anything that would reveal what you said in Confession. Obviously, he can’t say, “John confessed to me yesterday that he lied to his wife.” But he also can’t say anything indirectly to reveal that John lied to his wife. He can’t even hint at it. If he is invited to John’s house, he can’t act in such a way around John that would reveal John’s lie, even if he doesn’t say anything. If you think that a priest should be required to tell people when he hears that someone has committed a crime, keep in mind that people are more likely to confess to a priest if they know he will not turn them in, and then the priest can encourage them to do the right thing. 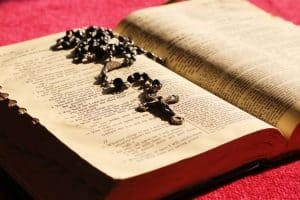 Furthermore, the Church does not want to get into a slippery slope with every priest deciding for himself what sins are serious enough to reveal. In many countries, the laws recognize that the sacrament of Confession is privileged, in a similar way to doctor-patient and attorney-client confidentiality. It is possible for a priest to talk about Confessions in general if there is no way the identity those people confessing could be revealed. For example, a priest might talk about the differences between the sins most men confess and the sins most women confess, or the differences between the sins most married people confess and most single people confess, if it is appropriate for a pastoral purpose. Although a priest could not say, “John lied to his wife,” he could say that some issues married people bring to the confessional include lying to their spouses. On rare occasions, a priest might be more specific. Even then, however, he is not allowed to say anything that will reveal whose confession he is referring to. If a priest is teaching people how to go to Confession, he may use examples from his experience, but he must not do so unless there is absolutely no way anyone’s identity could be revealed. For instance, a priest who is trying to explain why it is important to be direct when you confess might mention a time when a penitent’s attempt to use a euphemism for sin led to a misunderstanding. But if the priest does this, he must not do so in any way that would reveal the identity of the person with whom he had the misunderstanding. Canon law also prohibits a confessor from using his knowledge of what you confess in confession against you, even if he wouldn’t reveal your sins to anyone else (Canon 984). The seal of the confessional binds the priest who hears your confession, but it does not bind you when you confess. If you want to, you can talk with your priest outside of the confessional about your sins or anything he said during Confession if you need more spiritual advice or want to clarify something. You can also tell anyone else about your confession, both what you said and what the priest said. It is easy to think that your confession will stand out to a priest because it stands out to you. However, priests hear many thousands of confessions over the course of their ministry. It is very unlikely that your confession will surprise or shock a priest. Because he hears so many confessions, he has almost certainly heard other people confess whatever sins you will confess. The sheer number of confessions he hears will make it harder for him to remember yours in detail. Furthermore, some priests report that they experience “holy amnesia,” an inability to remember confessions as well as they remember other things. So go to Confession (here’s how) with confidence that the priest will keep your sins secret! God’s mercy is waiting for you!